So you’ve sorted out the job, the house, and the transportation. All that’s left to consider is… how will you spend the 72 hours a week you’re not asleep or at work? Your cousin Buck visited Winnipeg once, and he said there was absolutely nothing going on (he also might’ve just spent the entire time in his hotel room watching pay-per-view). Sorry, Buck, but here’s the reality: Winter, summer, rain, snow or shine — Winnipeg is a city chock-full of arts & culture where there’s always something being played, performed, presented or painted. In fact, Winnipeggers are about as spoiled as a kid with the password to his parents’ Amazon Prime account when it comes to sports, festivals and events— this past summer, there was a festival almost every weekend from June to September, including two full weeks of live outdoor music and entertainment for the Canada Summer Games 2017. To give you a better idea of what gives Winnipeg the well-deserved title of “cultural cradle of Canada”, we’ve outlined the average week of an arts-enthused Winnipegger (that is, assuming your notoriously no-nonsense boss grants you a much-deserved day off every once in awhile). Scenario: You’re a mid-level manager living alone in the city. You’re also an urbanite who likes nothing better than walking to work to your company’s downtown office tower from your sleek new (but affordable!) pad in one of downtown Winnipeg’s newest high-rises, the Glasshouse Skylofts. Start your week off with a laugh at the Winnipeg Comedy Festival, a weeklong event featuring the best of Canadian comedic talent in five one-hour gala events. Travel to Chile, Belgium and Ethiopia all in one evening at Folklorama, Canada's Largest and Longest Running Multicultural Festival. The popular two-week event takes place at dozens of venues across the city. Hop on a trolley for a microbrewery tour of Winnipeg and visit more than a dozen taprooms and craft brewpubs that have popped up over the last two years alone. 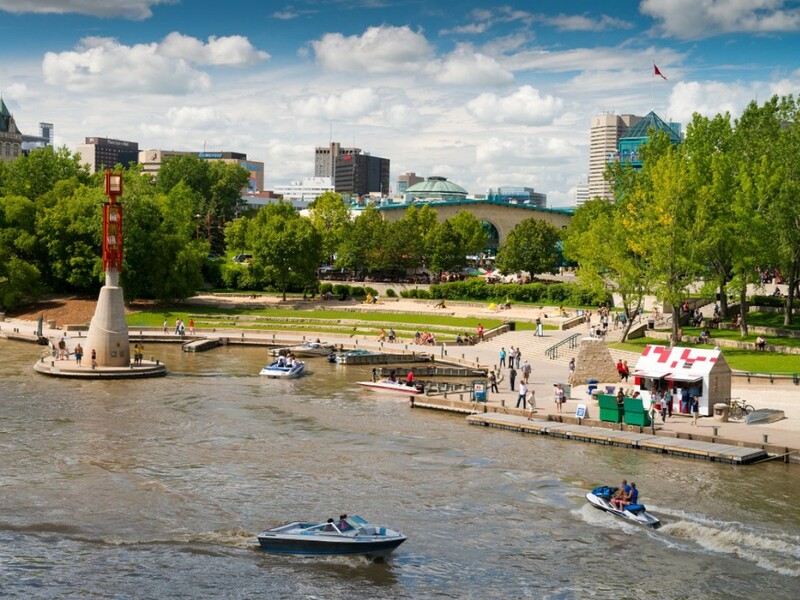 Walk over to the TD Winnipeg International Jazz Festival in the historic Exchange District, where the 11-day festival welcomes more than 40,000 music fans. The 30-block historical district is one of Canada’s architectural marvels with some of North America’s most extensive turn of the 20th century buildings. You decide to try your luck betting on the live horse races at Assiniboia Downs, but not before stopping for dinner at Langside Grocery, Super Deluxe, Underdogs or any of Winnipeg’s new restaurants. In the summer, Saturdays are best saved for festivals. You have a tough time deciding between the Winnipeg Folk Festival, Winnipeg Fringe Theatre Festival, Interstellar Rodeo, Oddblock Comedy Festival and Winnipeg BBQ and Blues Festival. You eventually decide on the outdoor Winnipeg Classic RockFest at Shaw Park. Surprise, surprise— another festival! This time it’s the Pride Winnipeg festival with celebrations, entertainment and beer gardens at The Forks and a parade through downtown Winnipeg. No matter the season, there’s always something going on at The Forks—today, you go for a skate down the Guinness World Record-holding longest naturally frozen skating trail in the world past hockey rinks, ice sculptures and RAW: Almond—a unique restaurant pop-up on the frozen river that takes place over three weeks each winter. You walk out your door and across Portage Ave to the recently-renovated Bell MTS Place, where you watch the Winnipeg Jets take on the Vancouver Canucks in front of 15,000 other loud, proud Jets fans. Beforehand, stop in for small Latin and Asian-style plates at the Merchant Kitchen, grab a burger at Oscar’s Deli or turn to our culinary guides at Peg City Grub to scope out other local supper spots in the downtown area. The first Wednesday of every month means free admission to the Canadian Museum for Human Rights (CMHR) —the first national museum to be built in nearly half a century. Hours are extended until 9pm, so you can take your time soaking in the stunning architecture and history at the first museum solely dedicated to the evolution, celebration and future of human rights. Grab dinner at the sleek new brewpub Brazen Hall (winner of this year’s Le Burger Week), then hop on their Bomber bus and head to a Winnipeg Blue Bombers football game at Investors Group Field. The partially-covered stadium was built in 2013 and is also a popular venue for concerts and special events, like the 2015 FIFA Women’s World Cup and the closing ceremonies for the 2017 Canada Summer Games. The first few weeks of September in Winnipeg offer back-to-back-to-back food fests—try some of the craziest burgers from more than 100 restaurants across Winnipeg for Le Burger Week, sample all sorts of cheese & gravy at the Poutine Cup and vote for your favourite food truck at Manyfest’s Food Truck Wars. Afterwards, laugh it all off at Rumor’s Comedy Club, where top comedians from around the world have been performing for more than 30 years, or catch a performance from the Royal Winnipeg Ballet, the Winnipeg Symphony Orchestra or the Manitoba Opera. Take a stroll through the Winnipeg Art Gallery (WAG), which houses the largest public collection of contemporary Inuit art in the world, and spend some time looking at the tufting, tattooing, painting, sculpture, installation, photography, sound, beading, media and performance that make up the new INSURGENCE/RESURGENCE exhibit. The WAG is also a venue for FLASH photographic festival, a month-long festival dedicated to photography with workshops, lecture series and events each October. Before you head home, join the crowd at Nuit Blanche—a free all-night exploration and celebration of contemporary art that takes place from dusk until dawn in Winnipeg’s Exchange District, St. Boniface and around The Forks each fall. Or, take your pick from half a dozen other festivals, including five days of music each January for Big Fun Festival, Winnipeg Design Festival, Central Canada Comic Con, Winnipeg Improv Festival or Festival du Voyageur, the largest winter festival in Western Canada. A crisp, sunny November morning is the perfect time to relax at the baths, saunas and steam rooms at Thermea Nordic spa. Built in 2015, the 16 & over spa is secluded in a wooded river bend and features a restaurant onsite (where you can eat in your bathrobe) and 6 different styles of massage, including hot stone and hydrothermea. After the spa, enjoy an innovative theatre experience at one of Winnipeg’s dozen performance venues including the Manitoba Theatre for Young People, Royal Manitoba Theatre Centre, Prairie Theatre Exchange and the historical Pantages Playhouse Theatre. © 2019 Economic Development Winnipeg Inc.